Just look how they got the media all against Trump, they can easily make up a big number, They won't do it next month just before elections looks to obvious. So they do it this month and Clinton campaign can harp on on it all month. US Jobs report out Friday. The median forecast is 169,000. You guys did a great job with reading the market last month, what are thoughts this month? Personally I think a miss to the downside?? Purchases declined 0.3 percent from July, the first drop in five months, after a revised 0.1 percent advance in the previous month, Commerce Department figures showed Thursday in Washington. 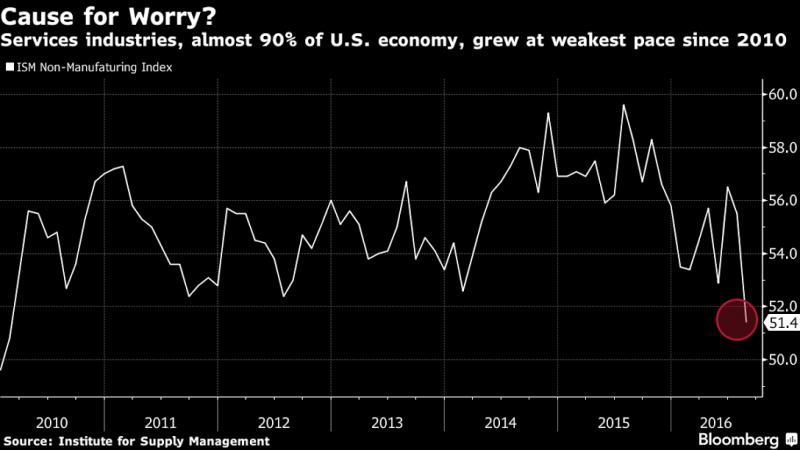 The median projection of economists surveyed by Bloomberg called for a 0.1 percent decline. Excluding cars, sales unexpectedly fell 0.1 percent. Nice chart on the ISM sent to me from a friend, shows a good picture how the economy has been declining.